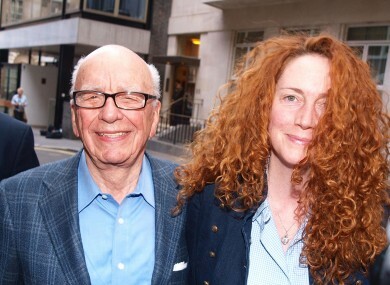 Rupert Murdoch and Rebekah Brooks in London recently. NEWS INTERNATIONAL CHIEFS Rupert and James Murdoch and former company CEO Rebekah Brooks will face questioning by MPs in the UK this afternoon over allegations of phone hacking at the News of the World. The Murdochs will appear before the House of Commons Culture, Media and Sport select committee at 2.30pm followed by Brooks’ appearance at 3.30pm. MPs are expected to ask questions about evidence given by Brooks and Andy Coulsen – both former editors of the News of the World – at a hearing in 2003, BBC News reports. The Murdochs and both Brooks and Coulsen, the former spokesman for the prime minister, deny having any knowledge that journalists and private investigators working for the now defunct News of the World hacked into the private voicemails of celebrities and members of the public. The scandal has hit a new level following revelations that murdered school girl Milly Dowler’s voicemail was hacked. Allegations about the relationship between News International, which owned the newspaper, and senior members of the Metropolitan Police have also forced two senior officers at the Met – Sir Paul Stephenson and John Yates – to resign in the last few days. Both Sir Paul and Yates are also due to answer questions from MPs today when they sit before the Home Affairs select committee. It has emerged that the Metropolitan Police employed the former editor of the Irish News of the World as an interpreter for 20 years. Alex Marunchak had access to highly sensitive information at the Met when working as a Ukranian language interpreter whilst he was still a reporter at the newspaper. Police have examined a computer, paperwork and a phone that were found in a bag left in a bin near the riverside London home of Rebekah Brooks. Her husband Charlie Brooks has claimed the bag is his and his spokesman says it has nothing to do with his wife or the phone hacking case, the Guardian reports. The Sun newspaper’s website was hacked last night with users redirected to a page with a mock-up story claiming Rupert Murdoch had been found dead. The hacking group Lulzsec claimed repsonsibility and said it was “sitting on their [the Sun's] emails”. TheJournal will be live-tweeting coverage of the Murdochs and Brooks in front of the Culture, Media and Sport select committee from 2.15pm this afternoon. Follow @thejournal_live for coverage. Email “Murdochs and Brooks to face questions over hacking scandal ”. Feedback on “Murdochs and Brooks to face questions over hacking scandal ”.